Toyota's new guide robot, formerly known as 'DJ Robot', has officially been named TPR-Robina, according to an August 22 Toyota press release. Photos reveal a slightly more professional look (no more scowling eyes) to go along with the droid's improved ability to avoid obstacles and operate autonomously, while agile, jointed fingers enable TPR-Robina to grasp writing utensils and sign autographs. 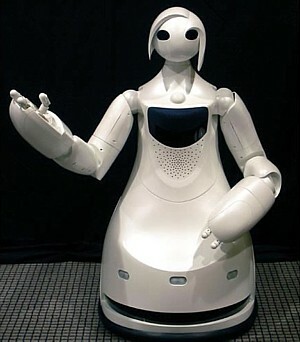 Further, in addition to being able to communicate using words and gestures, the 60-kg, 1.2-meter tall robot has an image recognition system that allows it to read visitors' name tags so that it can tailor its directions accordingly. TPR-Robina will begin working as a receptionist and guide at the Toyota Kaikan Exhibition Hall on August 27.